When you're selling Scottish salmon fishing access it's got less to do with actual 'catch statistics' than you may think. The salmon rivers of Scotland are the most beautiful natural arenas and it's their immense beauty coupled with the hypnotic flows of the river and the escape from work duties that are the biggest attraction for most salmon anglers. 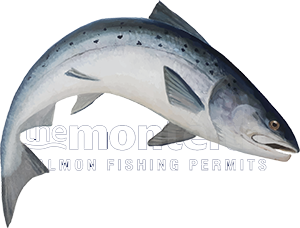 These days however it appears that every angler is completely dependent on seeing catches prior to booking a salmon fishing permit and if no anglers are fishing then guess what! Salmon have always been unpredictable and that's never going to change nor would I ever want it to. What then do you have to sell if you cannot guarantee a fish to a client (which you cannot) and there you have the answer. The possibility of a salmon is all the salmon angler needs to know regardless of how many fish have been caught and how many anglers are fishing for them. You simply cannot beat that feeling of having a chance nor eventually finding yourself in the right place at the right time as your lure or fly swings in front of a fish that wants to befriend it. Salmon do not understand our numbered weeks or statistical charts nor thankfully even the aerial elegance of the Spey cast when delivered correctly to the river. For them most of the time it's a reactionary response coupled with a desire to possess or investigate a moving fly or lure that will deter the outcome of your fishing day. This is the beauty and fascination of Scottish salmon fishing and if it were too easy to catch these fine creatures then where would the challenge be. It takes skill to catch the 'King of Fish' along with persistency & consistency of effort and long may that continue to be the case. I'm glad to be the forerunner in the revamp of how Scottish salmon fishing should be presented and I hope other agents will lift their game to the same level for the general well being of this amazing pursuit. Scotland is fortunate to have so many beautiful salmon fishing venues and it's about time the entire global salmon fishing community got to properly see them through the power and reach of the world wide web. If you're a Scottish salmon fishing agent get yourself into gear and get rid of any shabby internet presentation or slow to down load websites and start showing the Scottish salmon rivers and the brilliant career professionals who staff and promote these rivers some proper and genuine marketing respect.